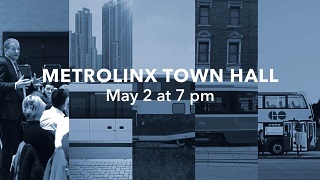 On May 2nd, CEO Phil Verster and the Senior Management Team answer your questions at our town hall in Durham. View the video from the April 10th, 2019 board meeting. The Union Station Bus terminal - part of CIBC SQUARE - is rising to change the face of Toronto. Go behind - and far below – construction barriers to see the amazing progress on the Eglinton Crosstown LRT project. Learn more about Metrolinx projects and initiatives and get involved.